Open House/Divided Estates, 2012-14, color, sound, 10 min. 37 sec. The architect Luis Barragán (1902-1988) loved tranquility and adored music, so much so that every single room of the house in Mexico City where he lived for 40 years, and even the garden, was outfitted with a record player and speakers. Preserved in the house today, along with the works of art and books with which Barragán shared his life, is his vast record collection, and the members of the Open Music Archive(OMA) researched this collection as their starting point in creating this work. In Mexico, music copyright laws are the world’s most stringent, remaining in effect for 100 years after recording took place or after the artist’s death. The Open Music Archive produced this work by selecting records with copyrights that had already expired when the current law went into effect, and weaving them together into a montage that restores music’s status as the common property of humankind, to be shared by all. 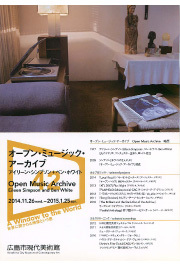 The Open Music Archive is a British collective formed in 2005 by Eileen Simpson and Ben White (both born 1977 in Manchester, UK, and currently living in London). Working primarily with audiovisual materials, the unit addresses themes encompassing both music and other art forms, and focuses in particular on conflicts between intellectual property rights and people’s freedom to appreciate creative works.